If your device is supported, the eduroam CAT tool is designed to automatically configure your device for eduroam use. To use this service browse to https://cat.eduroam.org. Click the link at the bottom of the page titled eduroam user: download your eduroam installer. In the Home institution search box type "Natural Environment Research Council". Note: Once you start to type in the phrase the search engine will automatically narrow down the results, so, once you can see "Natural Environment Research Council", click on it to select it. This will take you to the download page. 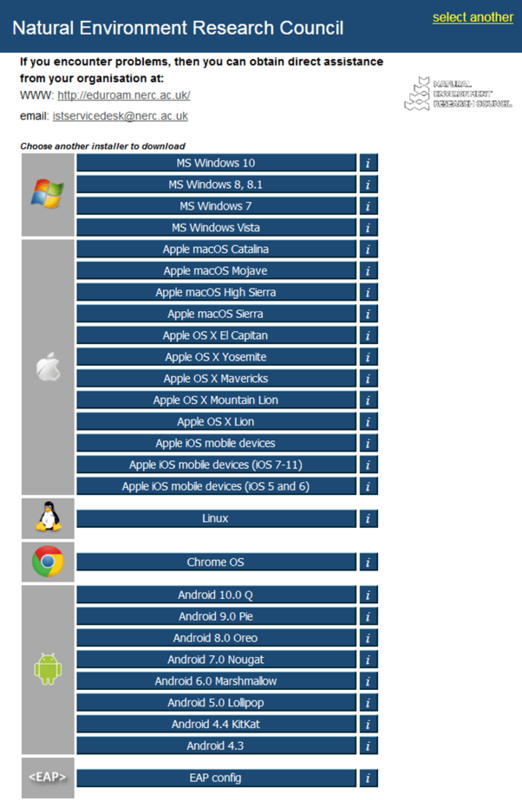 Simply select your operating system to download the CAT setup (click All platforms to see the full list of operating systems). Once the setup file has downloaded you will need to run it and follow the on screen instructions. You may be prompted for your device's administrative password (pin number or password). This will likely be at the beginning of the process. During the installation you will be required to enter your NERC Office 365 logon username and password.